Our guest speaker for the September meeting, Vejdi Avsar, offered numerous tips and suggestions on woodworking such as plywood and solid wood selection, joinery, and incorporating natural defects of wood into your design. His talk was informative as well as inspiring. Steve Wavro’s Sister-in-Law asked Steve for a pink flamingo that he crafted from a Judy Gale Roberts design and 88 pieces of wood. His favorite part was putting together the pieces to resemble reflections in the water. From a Steve Good pattern Rick Spacek crafted twin horses cut out of elm and then finished with Shellac. The series of horses is called “Out of the Shadow” which Rick cut out of mesquite then sprayed with clear finish. George Graves made a candle holder for his wife using an old power line insulator from the Dakotas, a Texas emblem for a friend moving to Germany, and an Oreo cookie that looks sweet enough to eat. Walnuts are edible, aren't they? Norm Nichols presented three holders of pecan, pine and FOG2 wood that allow you to hang two wine glasses, empty, that is, from one bottle. Lon Kelley, using rough cedar, made fifty bird houses to be donated to schools for Down Syndrome children to paint for fund raising. Lon also explained how he cleverly combined a ten inch blade with eight inch dado blades to make rabbet and to-length cuts at the same time. David Janowitz got his new lathe up and running, and turned a bowl from a walnut veneer log, another from an unknown wood, possibly padauk, and rolling pins from Osage orange and cedar-oak. Terry Parrish crafted this US flag with the US Marine Corps logo for his brother. Terry used a CNC3 machine for make the stars and the logo. A judicious use of a torch followed by staining created the desired effect. From a 2x6 yellow pine, Chris Schwartz made a toy Mars Shuttle from a simple design. This heavy duty table saw sled with miter jig was made by Mark Womack. Noting that parts are expensive the runners are of wood rather than metal. Two Arks were crafted by Denis Muras. This particular Ark was then donated to the Austin County Republican Party Banquet, for their Silent Auction. The other one will be donated to the Woodworking Club of Houston for the annual craft sale in November. Plans for the Arks originated from Toymaking Plans. The Arks are made from a careful selection of various species of wood for the precise coloration of the hull of the vessel. The proper species was also selected for the animals that Noah is taking on this cruise. Examples are: zebrawood for the tigers, lovely stripe effect, walnut for the elephant, that dark brown color (I could have dusted them for sand but in the ark they should be comfortable), wenge (wing-gay) for the rhinoceros, that coarse skin effect, maple for the nice white swans, etc. Bill Harris showed examples from his collection of 800 toys that were crafted from Wink1 wood, pieces of siding, drum sticks, defective toss outs and FOG2 wood. Fred Sandoval showed club members that his work-in-progess violin was not “broke” but was Baroque style. Fred explained how this style was different from more typical varities. Fred used sycamore and pine. Of interest were the special on-line ordered nails used to secure the neck to the body. From a metal lawn chair, an old ironing board, cabinet doors, and rubber pieces from a fork lift, Bob Wink crafted his collection of folk art Banditos sans Fritos. 1Wink Wood: Bob Wink lives near a commercial woodworking facility that gives away what they consider to be scrap pieces of commercial grade plywood and misc hard woods. Bob rescues this wood before a Grinch comes and takes the scrap for firewood. 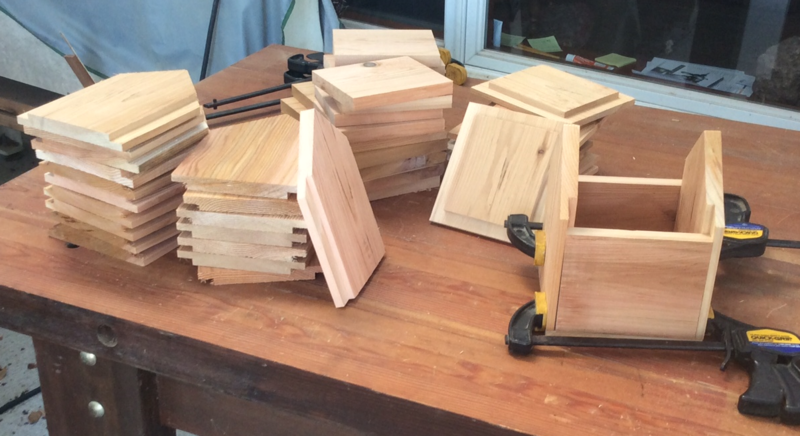 Many woodworkers in WWCH have made good use of these excess pieces by making jigs, toys, and incorporating them into their projects as you’ve seen in many Show n Tell projects. This source of wood is what has become known as “Wink” wood.